Where we talk about how we have started to use iPads at the Nova Career and Education Centre of the New Frontiers School Board. When introducing new teaching tools be sure to include a lot of teacher-centered PD, allowing time to address teacher concerns with the hows and whys of using new tools, the fear of changing teacher roles, working through discomfort with technology, and allowing for teachers to learn how to use the tools in a meaningful way. 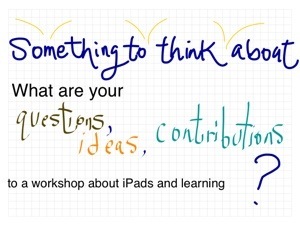 iPads are tools to help teachers bring great pedagogy to their students and learning environments. Don’t throw a bunch of iPads into a classroom and expect magic to happen. iPads are best used when they are recognized as individual user devices. Don’t try to use them and control them in the same way that you would paper workbooks or computers and laptops. You can not control which apps a student chooses to use on the iPad (beyond limiting the apps you put on it…but even then, a savvy student can download whatever app they want.) What I find great about a tablet is that the apps allow us to offer much more individualized and interactive learning experiences so students are generally more engaged in active participation than evasive techniques. As opposed to focusing on specific apps, I like to look at what is already available on the iPad that can enhance learning. Specifically, the video capabilities are fabulous ways to practice langauge, understanding, performance tasks in a safe way. Ali’s Top 10 Math apps – they range in price from free to $7.00. Only 1 requires wifi to use (Ace). Algebra Touch – touch and see how algebra works. Tritutor – search for this in your app store. The links I found all point to the US app store, which won’t work for us but it can be found on the app store from your iPad. Ace – High School Math Algebra (require wifi). Step-by-step video examples for a variety of high school algebra topics. WinPossible Geometry Tutor – (from the website) Having difficulty with some parts of Geometry or just need a refresher course? Then this video series is for you. With 15 MAJOR CATEGORIES and 81 VIDEO LECTURES totaling over 7 HOURS of lessons, Video Geometry Tutor covers all the essential areas you need to know about Geometry. Math Aptitude – Looks like a comprehensive math learning app for multiple topics (high school). The link goes to the US store, you may need to search for it within the Canadian store or directly from your iPad.